At Nambiti Hills, we have been witness to a special treat on recent Game Drives – the birth of brand new baby hippos. This stub-nosed bundle of wrinkly cuteness was born toward the end of July. The birth of this calf in particular, has been wonderful to see because its mother lost a baby to an encounter with a bull last year. 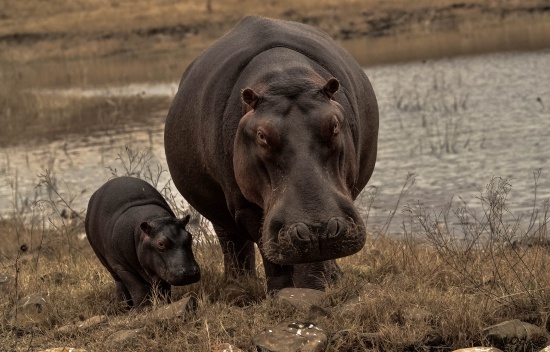 Male hippos are notoriously aggressive, especially toward babies if they are unsure of their parentage. She has been keeping a keen eye on her calf, always positioning herself between the new born and the dominant male of the group, to make sure that the calf is safe at all times. The babies have been surprisingly curious and bold – making their way up to the Game Vehicles. This has been a photographer’s dream, with ample photo opportunities presented to Guests and Guides alike. We hope to see this little one grow big and strong, and will keep you updated.